This is the story of Durgeshwari Devangan, who is studying in Class 12th of Government Higher Secondary School of Jhalma. She lives in the village and is deprived of a lot of facilities. Nonetheless, she leaves no stone unturned to excel in studies. That is how she scored 90 percent marks in her 10th class examination. 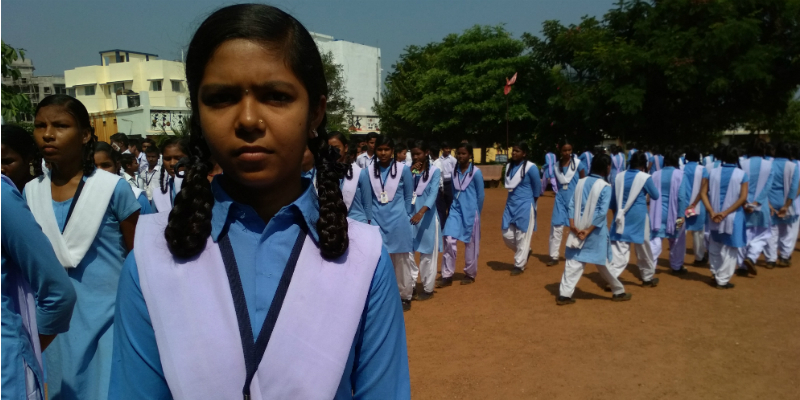 At present, she is studying in 12th standard and wants to become a teacher by profession, so that she can teach other children and help them become doctors or engineers. She wants to become a teacher because, according to her, only a teacher can build personalities who can go on to serve the society. Durgeshwari says that she was inspired by her English teacher Rekha Sahu and that is when she got this idea of becoming a teacher. Her love for books is the result of the way her English teacher teaches her. Today, her hold on Biology is strengthening and if she wishes, she can go on to become a doctor and serve the society. But she does not want to become a doctor, and instead, wants to become a teacher and make many such doctors out of students like her. She also shared the secret of her success. She said that she listens to her teachers very carefully. She pays full attention to whatever is taught in the class. This makes it easy to understand the subject and when she reads it again it becomes easier for her to commit it to the memory. Durgeshwari was a smart girl from the very beginning. She has passed with good marks even in the primary and middle school examinations. After passing eighth standard, she had to take admission in a high school in Jhalmala, which is very far away from her native village. She started facing commuting problems. After reaching high school, she had to make a lot of efforts. Her father Ghanshyam Devangan and Mother Usha were working in the fields of to run the family. Therefore, she could not even mention about the lack of resources. Subsequently, as she reached her 10th standard, the government gave her a bicycle under the Saraswati Cycle Yojna. This made it easier for her to go to the school. Earlier, it used to take a lot of time to travel to and fro and a lot of energy was wasted too. After getting the bicycle, she could focus better in studies and that led her to score good marks in her 10th standard. After studying, Durgeshwari also spares some time for her grandparents. She takes good care of them and also encourages her younger brother Khilawan, who is now in 9th grade, to study harder. Durgeshwari says that while teaching Khilwan, she feels closer to her dream of becoming a teacher and her urge to teach the students of her village reinforces. She says that there is no shortage of talent in the village, but due to lack of good teachers, they do not get proper guidance.